The Civil War Trilogy Box Set: With American Homer: Reflections on Shelby Foote and His Classic The Civil War: A Narrative (Modern Library) est le grand livre que vous voulez. Ce beau livre est créé par Shelby Foote. En fait, le livre a 2984 pages. The The Civil War Trilogy Box Set: With American Homer: Reflections on Shelby Foote and His Classic The Civil War: A Narrative (Modern Library) est libéré par la fabrication de Modern Library. 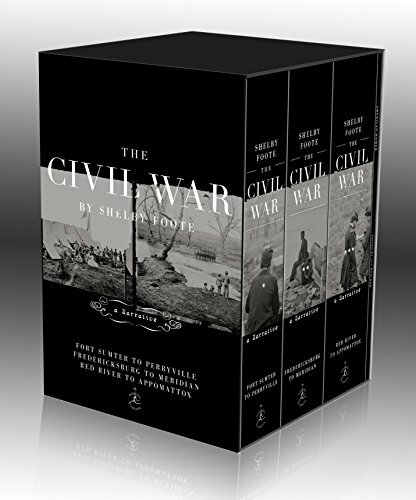 Vous pouvez consulter en ligne avec The Civil War Trilogy Box Set: With American Homer: Reflections on Shelby Foote and His Classic The Civil War: A Narrative (Modern Library) étape facile. Toutefois, si vous désirez garder pour ordinateur portable, vous pouvez The Civil War Trilogy Box Set: With American Homer: Reflections on Shelby Foote and His Classic The Civil War: A Narrative (Modern Library) sauver maintenant. On the occasion of the 150th anniversary of the Civil War, the Modern Library publishes Shelby Foote’s three-volume masterpiece in a new boxed set including three hardcovers and a new trade paperback, American Homer: Reflections on Shelby Foote and His Classic Civil War: A Narrative, edited by and with an introduction from Pulitzer Prize winner Jon Meacham and including essays by Michael Beschloss, Ken Burns, Annette Gordon-Reed, and others. Random House publisher Bennett Cerf commissioned southern novelist Shelby Foote to write a short, one-volume history of the American Civil War. Thirty years and a million and a half words later—every word having been written out longhand with nib pens dipped into ink—Foote published the third and final volume of what has become the classic narrative of that epic war. A selection of these letters, along with essays by Jon Meacham, Michael Beschloss, Ken Burns, Annette Gordon-Reed, Michael Eric Dyson, Julia Reed, Robert Loomis, Donald Graham, John M. McCardell, Jr., and Jay Tolson, are included in American Homer, the bonus paperback book available only in the Modern Library boxed set of The Civil War. Shelby Foote’s tremendous, sweeping narrative of the most fascinating conflict in our history—a war that lasted four long, bitter years, an experience more profound and meaningful than any other the American people have ever lived through—begins with Jefferson Davis’s resignation from the United States Senate and Abraham Lincoln’s departure from Springfield for the national capital. It is these two leaders, whose lives continually touch on the great chain of events throughout the story, who are only the first of scores of exciting personalities that in effect make The Civil War a multiple biography set against the crisis of an age. Four years later, Lincoln’s second inaugural sets the seal, invoking “charity for all” on the Eve of Five Forks and the Grant-Lee race for Appomattox. Here is the dust and stench of war, a sort of Twilight of the Gods. The epilogue is Lincoln in his grave, and Davis in his postwar existence—“Lucifer in Starlight.” So ends a unique achievement—already recognized as one of the finest histories ever fashioned by an American—a narrative that re-creates on a vast and brilliant canvas the events and personalities of an American epic: the Civil War.